Traveloscopy Travelblog: Why can't I carry-on my duty free alchohol? Why can't I carry-on my duty free alchohol? It’s one of the most confusing things about duty-free shopping at overseas airports. How come some airports will allow duty free alcohol to be purchased and taken aboard, while others not? Of course, there is a long back-story to this, but the quickest explanation is that you may purchase alcohol (or liquids over 100ml) if the vendor is able to deliver it to you after passing through the boarding gate ie: just as you board the aircraft. This is possible in KUL for example, but not in BKK. Why? No idea, but that’s the rule. One notorious trap for Aussies is transiting through AKL, where if you are able to leave the fluids on board (ie you are not changing planes, merely going for a walk while they refuel) you can keep it. 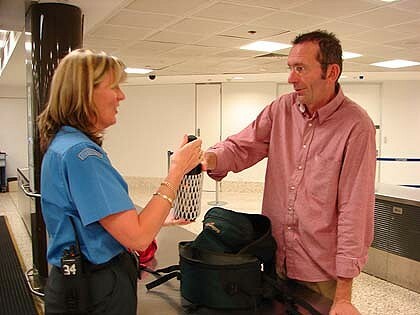 If you are changing planes, then you must pass through the customs screening and the smiling officer will smile a little wider when he tells you to surrender your Johnny Walker Blue Label. This happened to me with a small hipflask of whiskey. On returning home, I notified the Sydney Duty Free company who sold it to me at the airport without warning and they refunded me when I sent a copy of my receipt and travel itinerary. A travelling companion, who turned out to be a bit of a hothead, told me instead of surrendering his Johnny Walker, he charged back out of the transit screening area and gave it to the first person he saw heading towards baggage claim. Then there’s that famous story of the bloke who sculled his vodka rather than give it up. Not only did he miss his flight because he couldn’t walk, he ended up in hospital.